In this article we will see the procedure to integrate Microsoft Dynamics CRM 2015 with Microsoft SharePoint 2013, both on-premise installations. You can use the document management capabilities of SharePoint from within Microsoft Dynamics CRM. 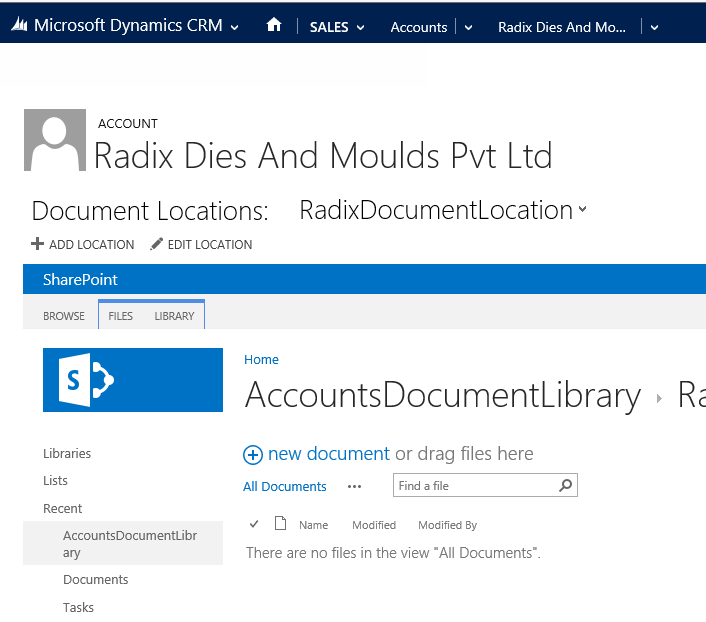 You can store and manage documents in the context of a Microsoft Dynamics CRM record on a server that is running SharePoint and leverage the SharePoint infrastructure to share, manage and collaborate efficiently. Because the documents are stored on a server that is running SharePoint, non-Microsoft Dynamics CRM users can directly access the documents on the server, provided they have the appropriate permissions on the server that is running SharePoint Server to do so. Step 1: Click on CRM -> Settings -> Document Management as shown below. Step 2: You will settings available under the document management settings. 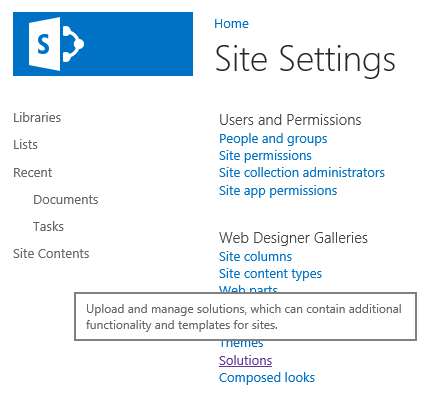 Step 3: Click on Document Management Settings, enter the SharePoint site URL where you want to save documents. Click Next. In case you don’t have the Microsoft Dynamics CRM List Component it will give you the following warning. 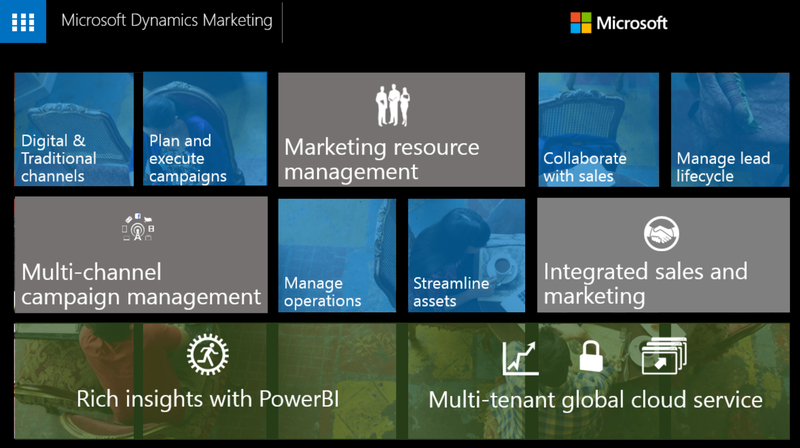 Step 4: We need to setup SharePoint for this List Component. For that download the List component for the correct version of CRM and upload it into the Solutions Gallery of SharePoint. Step 5: Activate the solution and be sure that the Status is activated. You may get errors in activation. To rectify, make sure the Microsoft Dynamics CRM Sandbox Processing Service and Microsoft SharePoint foundation Sandboxed Code Service services are started. Step 6: Document management can be enabled for those entities in Microsoft Dynamics CRM that can be customized. By default, document management is enabled only for the following entities in a new installation of CRM. You can enable document management for an entity, as shown below. Step 7: Once document management is enabled for an entity, you will see the option for documents as shown below. 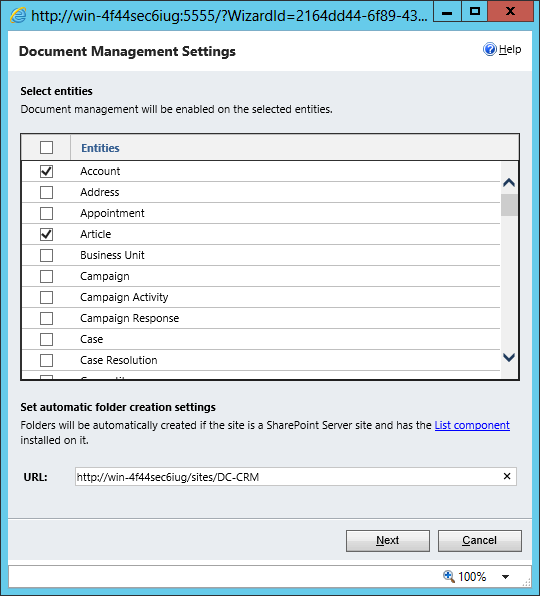 Step 8: You can add document location for this entity assuming the location is created and the appropriate permissions are set on SharePoint. Step 9: And if everything goes right, you will see the familiar (at least to me) interface of SharePoint from within Dynamics CRM as shown below. You can start uploading documents and use document management functionality. Step 10: In case you do not want to manage the folder structure on your own and let CRM make it for you, if the CRM List Component is installed correctly, you get an option for creating a folder structure based on the entities. CRM users and non-CRM users can work together to achieve common business goals through improved communication by this integration.